Garlic Brie-Champignon - Zuercher & Co. This double cream brie is made from cow’s milk from the Bavarian Alps and flavored with garlic and herbs. 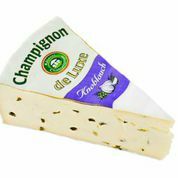 It matures three weeks in special ripening rooms, where it develops a smooth texture and a slightly piquant flavor.